I live in the wild west. 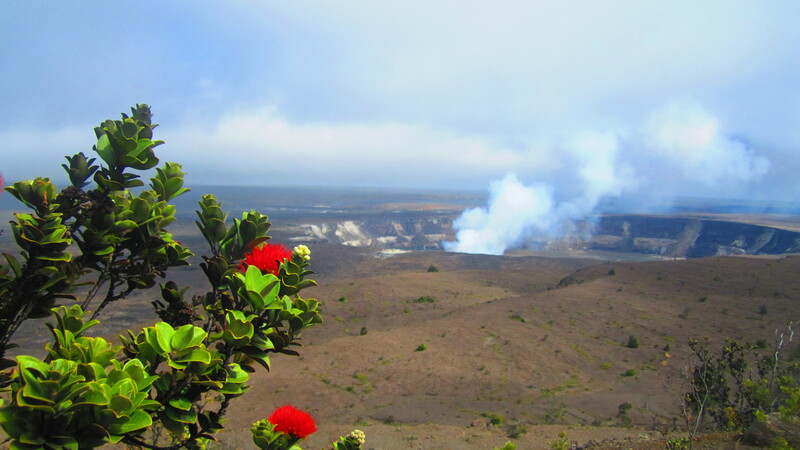 I’ve called Puna district of the east side of Big Island Hawaii for the last four months. Life here is much different from any mainland city I either lived in or was a surburbanite of. Puna district and Hedonisia Hawaii, where I’m working and living, is in Lava Zone 1, which means first to go when the active volcano, Kilauea decides unleash her wrath. The property I live on is 4-acres filled with the most magnificent, beautiful, eerie plants, animals and land formations. A walk up the property one way, and I’m battling a cluck of free-range chickens that bop around. They lay eggs where ever they want, so we egg hunt everyday. Whoever’s lucky enough to find a few can make egg salad. Imagine that. 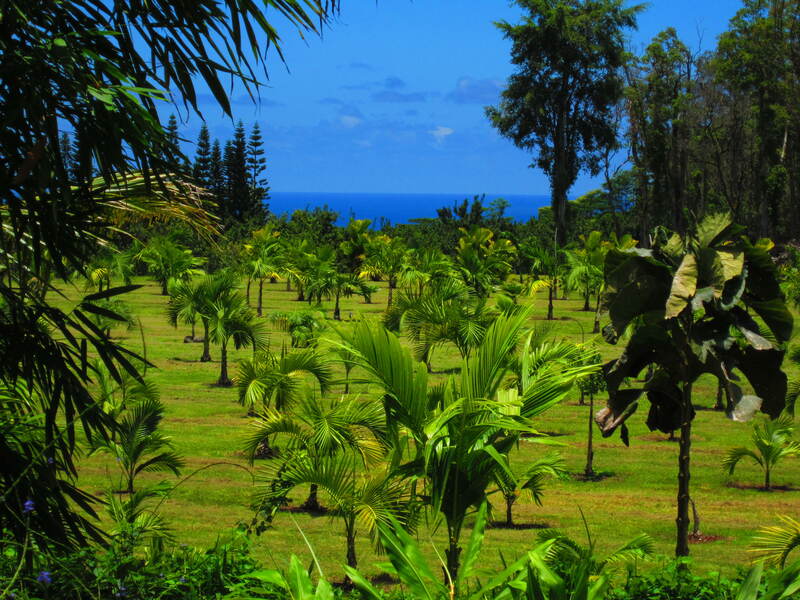 We have two lodgings on property, perched on several hills of cane grass, papaya and strawberry guava trees, that have a magnificent ocean view of the Pacific. Drifting off to sleep at night when the winds pick up, the ocean breeze wisps on your face as if bidding you adieu. We have a lava vent on our property. To get to it, you hike into the on-site crater, the path down crafted from cinder and old tires. Snaking your way down to the crater you pass a grove of banana trees, then come into a clearing where there are taro leaves 6 feet tall. It’s Jurassic, baby. To get to the lava vent, we hike a sparsely maintained, pretty gnarley trail up and up, grabbing onto to strawberry guava trees (they are especially strong) to keep our footing along the cliff. I do this hike often…it’s right in my backyard! I turn and look around and I’m floored by the Hawaiian paradise I’m surrounded by. Innumerable palms, guava trees, red and black lava rock, lush green landscapes under the hot sun: my playground. The lava vent is a 200-foot drop into a black, dark abyss. To see the scope of it, you swing yourself over the cliff’s edge by hanging onto a root that’s implanted into the lava rock wall. We secure our footing, swing ourselves over and contemplate this island’s energy. I throw rocks down there to measure its intimidating depth. The landscapes here are surreal. I feel like I am living in a dream when I’m standing on the edge of a beautiful, craggy black cliff over the ocean. It’s an intense landscape, almost too beautiful to be real. There’s natural warm ponds 3 miles from my home and they’re heated by the volcano. You slip in and slip away, feeling instantly healed while you lie on your back, soak in the warm water and watch the green palms sway overhead. One of the more special moments on the island was soaking in the warm pond with some friends and a local Hawaiian. We stared for hours at the way the sun refracted off the pool of water onto the surface of the black lava rock overhead. It danced and glistened. Nature’s light show. With the immense, intense landscapes come the intense people who live here. 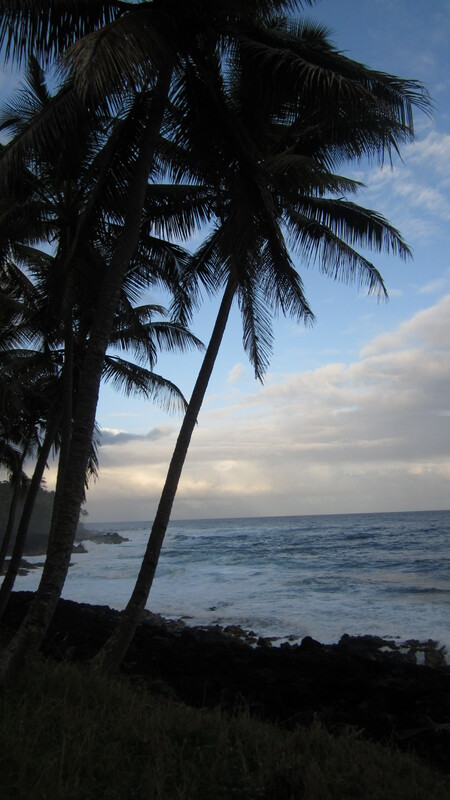 Within Puna district, over 80 different intentional communities exist. Life is different here, more tribal. Community is number one, especially with the locals. The reason why so many people live alternative lifestyles out here is because Puna has a sort of “edge of the world” mentality. People come here to heal, to vacation for a short time, or to escape their old lives. People hide here. There are strange folks that populate this part of the island. I live 5 miles from the nearest grocery store and more often than not, I hitch hike in. Hitch hiking here is safe, but unreliable. A few times I’ve had some unsavory characters pick me up, but almost everyone I meet is genuine and exceptionally helpful. I’ve even made friends through hitch hiking who’ve given me my first surf lesson or invited me to some event. Meet Uncle Al. 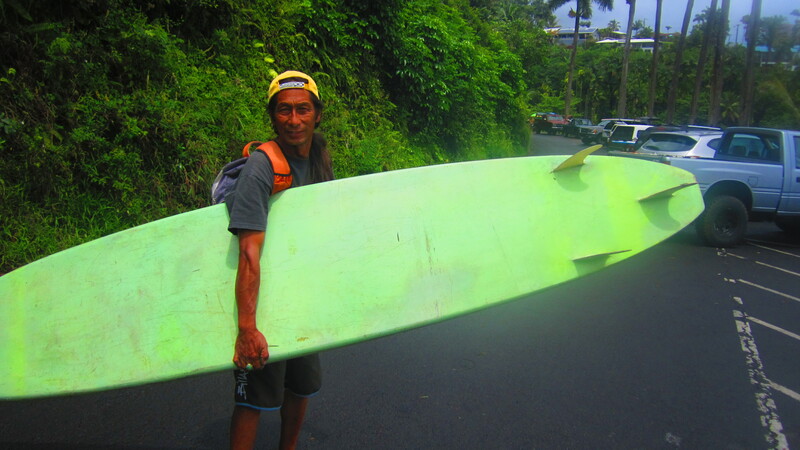 A kind, local hitch who took me surfing for the first time. The dogs here bark at night. At the wild pigs. We have black wild pigs that run around in the night and scamper away when you come near them. They’re not aggressive, but they do mess up our gardens and screw up our trails! They are hunted and killed regularly. I live just up the block from a Geothermal Plant, a plant that uses the steam of the volcano to supply people with electricity. Now THAT’s pretty cool. But super loud at night on top of the coqui frogs. Those frogs chirp so loudly at night I need to sleep with earplugs. They’re an invasive species from Puerto Rico. A lot of species here in Hawaii and are invasive. They were introduced as a means to eliminate another problem critter. For example, Hawaii has a crazy high feral cat population. They straight up run the joint. They were brought here to hunt mongoose, but they mostly hunt the rapidly-declining native bird population. So it goes. Life here is precious and different. These are some basic observations and facts about my life here. Every day is a little different, with a new my lesson to learn, with more fruit to eat in a land so beautiful, it’s incredible. The difference about Hawaiians and haoles (white person, means literally without breath) is that those here see the beauty in front of them everyday, nature made. They aren’t living in anxious anticipation for the future. They are enjoying the beautiful now. That is an awesome place to call home! Hi There, We are working on possibly showing the “hawaii jungle life” in a show for a major network and are looking for inspirational and resourceful characters. Can you tell me more about your story?